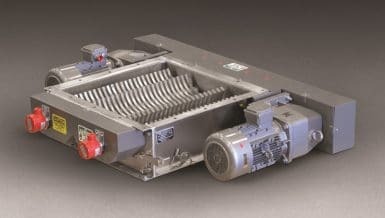 A new model RDC-2424-MS De-Clumper" Rotary Lump Breaker from Munson Machinery breaks chunks of agglomerated abrasive or friable materials that have compacted during storage or shipment, conditioning them for downstream processing or conveying. Material entering the 24 in. (610 mm) square inlet is reduced in size by dual rotors with three-point, single-piece, AR-235 abrasion-resistant steel breaking heads rotating with minimum clearance above a curved, perforated bedscreen. On-size material exits through 1 in. diameter (25.4 mm) apertures in the bedscreen. Other bedscreens are available with apertures ranging from 1/32 to 2-1/2 in. (25 to 64 mm) in diameter. Powered by a 7.5 HP (5.6 kW) motor with gear reducer and a rugged chain and sprocket drive, the synchronized shafts rotate at approximately 120 RPM, offering high throughput rates with minimal heat generation. A side mounted bedscreen can be rapidly removed for cleaning, replacement or maintenance. Dual rotors with three-point, single-piece, abrasion-resistant breaking heads rotate with minimum clearance above a curved, perforated bedscreen with apertures from 1/32 in. to 2-1/2 in. (25 to 64 mm) in diameter. 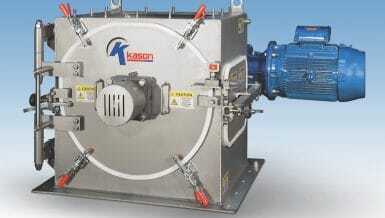 The company also manufactures higher capacity models with square or rectangular inlet openings up to 48 in. (1219 mm), and up to four rotors driven by motors up to 40 HP (30 kW). 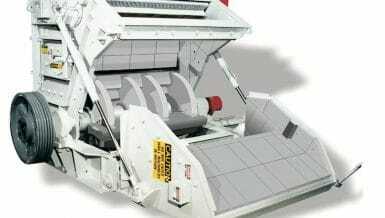 Other size reduction machinery offered by the company includes Screen Classifying Cutters, Pin Mills, Attrition Mills, Rotary Knife Cutters, Hammer Mills and Shredders. Blending equipment includes Ribbon/Paddle/Plow Blenders, Rotary Batch Mixers, Rotary Continuous Mixers, Fluidized Bed Mixers and Variable Intensity Blenders. This article is published by Munson Machinery Company, Inc.